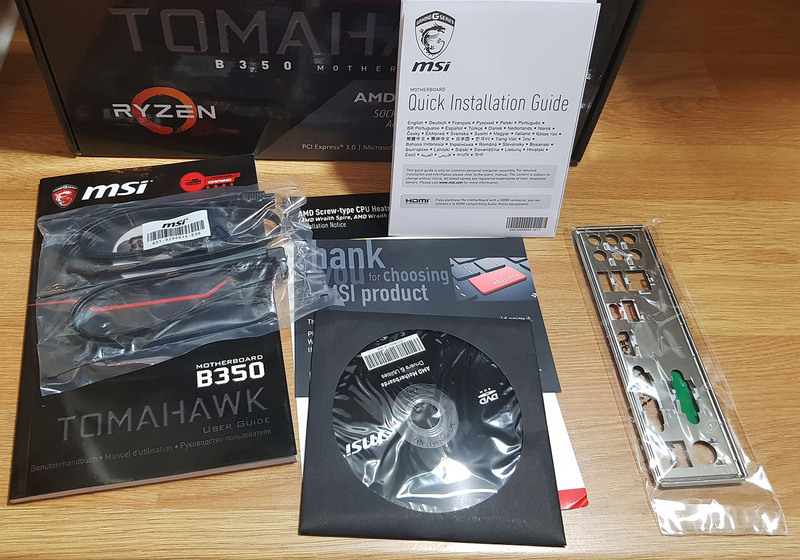 The B350 Tomahawk is a solid option given the component choice and offers virtually everything you would expect from a $100 offering. One of the defining features of this particular B350 model is that it does technically support two-way CrossFireX multi graphics cards configurations. 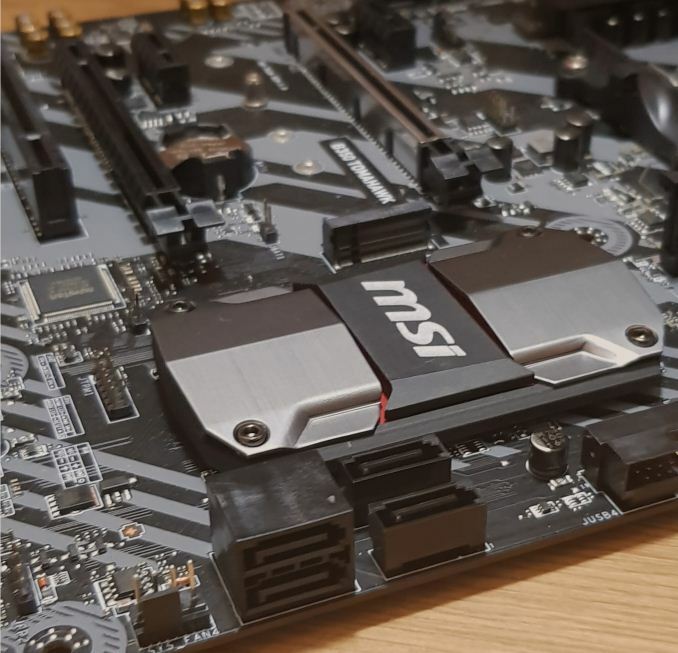 The top PCIe 3.0 slot, which has been reinforced with MSI’s Steel Armor, operates at x16 with a single GPU, whereas the second slot operates at x4, but is only PCIe 2.0. Even though the B350 Tomahawk doesn’t have support for NVIDIA SLI, users looking to utilize more than one graphics card should look towards the X370 chipset as this has far better options, and X370 supports SLI too. An interesting element is that this board does not have any USB 3.1 (10 Gbps) ports, despite the chipset supporting them. The MSI B350 Tomahawk conforms to the usual ATX sizing (305 x 244mm) and features a shiny grey PCB with red accents on the power delivery heat sinks. This is a budget focused board, so the PCB is scarce beyond the aesthetics, but this is normal for a board of its price range. On networking, the Realtek 8111H controller is located on the rear panel, and for audio is the Realtek ALC892 codec. Based on our performance numbers, the ALC892 as the low-end 7.1 option does perform a little bit worse than the slightly more expensive ALC1150 and ALC1220 codecs. The B350 Tomahawk does not feature a S/PDIF output, but rather it makes use of an additional 3.5mm audio jack which puts the total up to six on this particular model. The audio component section features an isolation line from the rest of the PCB to reduce inductance between the digital and audio traces, but there is no EMI shield on the codec. There are a set of Nippon Chemi-con gold audio capacitors to support the on-board audio. There is a full compliment of DRAM slots on the MSI B350 Tomahawk, with support for up to a maximum of 64GB of DDR4, and the motherboard is listed up to DDR4-3200 for Ryzen CPUs/APUs or DDR4-2400 for Bristol Ridge APUs. Underneath the darker grey heatsinks is a formidable (for the price range) set of midrange NIKOS MOSFETs, supplemented and controlled by a single AMD SVI2 compliant Richtek RT8894A PWM phase controller. The phases run in 4+2 configuration with the two being designed for the APU and SoC segments of the chip. With a lot of heat (pun intended) on motherboard manufacturers to improve the power delivery cooling, MSI has gone with a very reasonable offering of a metal bulk for better heat dissipation. It is nice to see a lower end board feature more function than flash, and a better design than some RGB enabled plastic. 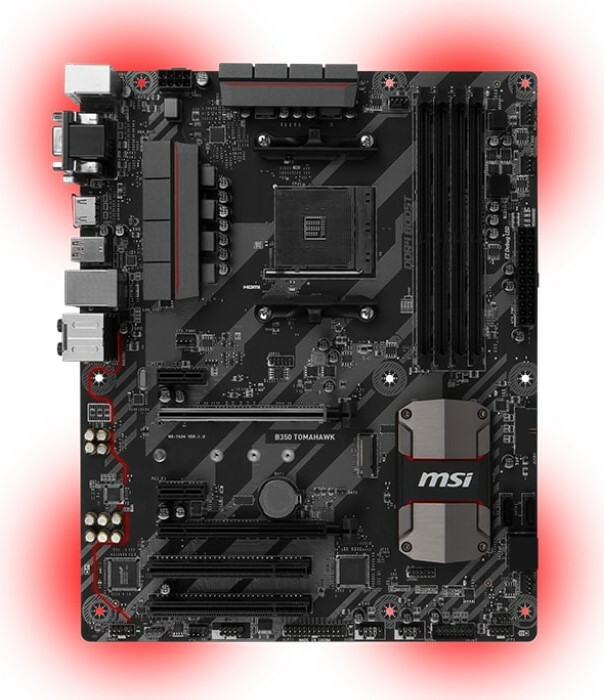 Some users may care that the heat sinks do not feature RGB LED lighting, or any lighting for that fact, but MSI has implemented red LEDs on the rear to provide an ambient red glow (of sorts) when installed into a “closed” chassis. 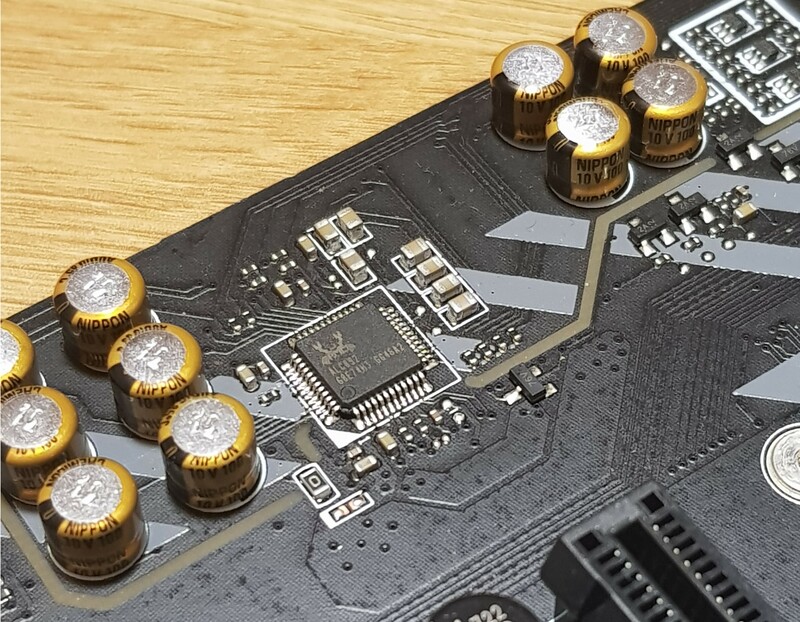 There is an additional 4-pin RGB header towards the bottom of the board. 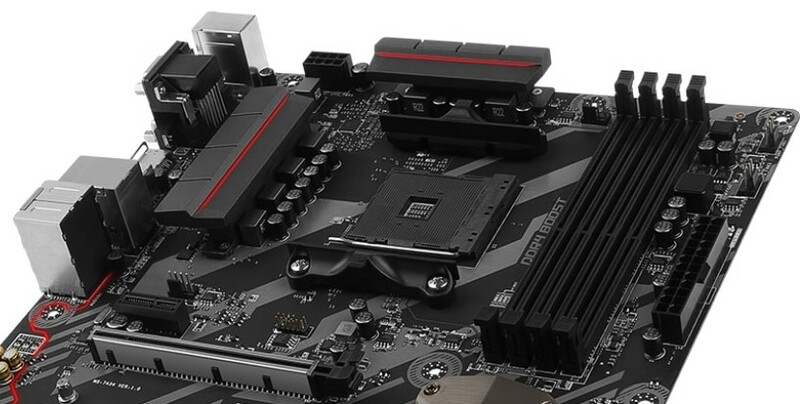 One of the biggest differences between the B350 and X370 chipsets is storage support: the B350 chipset has native support for four SATA 6Gb/s ports, while the X370 chipset supports six. On the MSI B350 Tomahawk, two of the SATA ports are angled while the other two are vertical with the board. 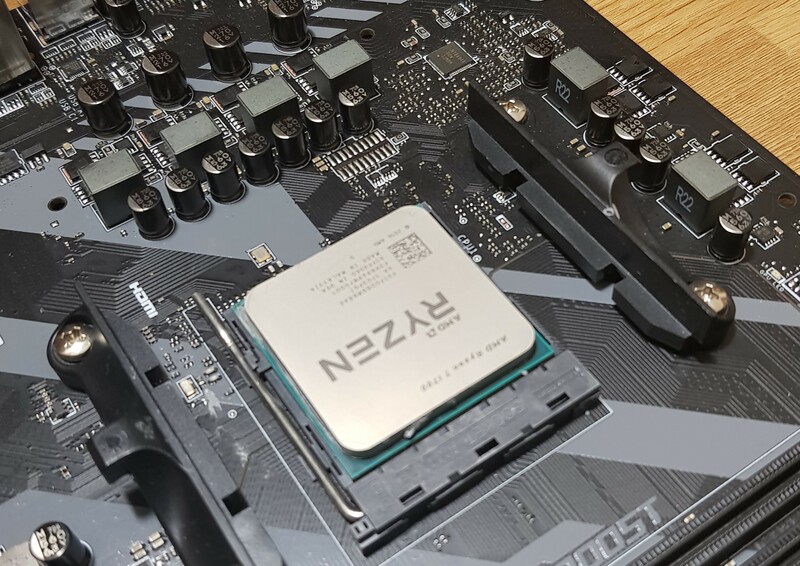 Typically this vertical arrangement is seen on cheaper motherboards. Along with the SATA ports is a single PCIe 3.0 x4 slot, suitable for NVMe drives up to 110mm. On the rear panel, from left to right, there is a combination PS/2 connector, two USB 2.0 ports, a VGA video output, a DVI-D video output, a HDMI port, a USB 3.0 Type-C port, three USB 3.0 Type-A ports, a network port, and the audio jacks.